Tobin offers a substantially new interpretation of Romans, looking carefully at the specific contexts in which Paul wrote the letter, the internal literary cues to its structure, and the rhetoric and philosophical style of his arguments. This book is not a commentary, but offers new and perhaps truer views of Paul's actual concerns and objectives in writing the letter--and to the arguments he makes in it. 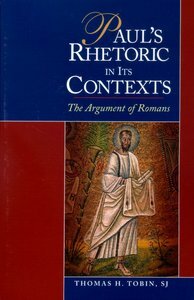 About "Paul's Rhetoric in It's Context"